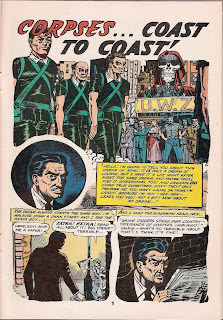 Little did I know when I taught my intro to comics course this past winter, starting with one of the worst comics of all time, that my student Stefan Claypool was a multi-media superstar--the driving force behind Middlebury Radio Theater. You know where this is going. Without further ado: Corpses Coast to Coast...the radio drama! Under any other circumstances, I'd call it over the top, but that's really not possible with this story, which I found in the Mr. Monster's Hi-Shock Schlock reprint comic.